Understanding Qualitative Research and Ethnomethodology provides a discussion of qualitative research methods from an ethnomethodological perspective. 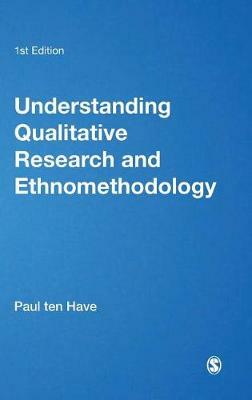 Detailed yet concise, Paul ten Have's text explores the complex relation between the more traditional methods of qualitative social research and the discipline of ethnomethodology. It draws on examples from both ethnomethodological studies and the wider field of qualitative research to discuss critically an array of methods for qualitative data collection and analysis. With a student-friendly structure, this engaging book will be an invaluable resource for both students and researchers across the social sciences.